Color(s): White with patches of gray, sandy, chocolate, and black. 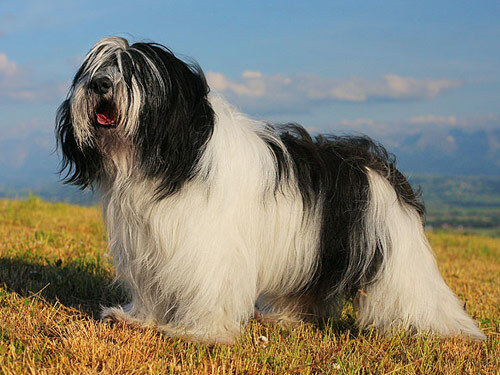 Also referred to as the Polish Lowland Sheepdog, this breed originated during the 13th century. The Polish Owczarek Nizinny's were used in the herding and guarding of sheep and cattle as well as companions. This breed was nearly extinct after World War II with only two males and one female surviving. Those three are the foundation of all of the Polish Owczarek Nizinnys of today. This breed is relatively rare in the United States. The Polish Owczarek Nizinny breed is compact, of medium-size, muscular, and strong. The Polish Owczarek Nizinny is independent, agile, athletic, and durable. They are alert, clever, and keenly perceptive. The Polish Owczarek Nizinny is not recommended for first time dog owners. This is a breed that has a strong-willed mind of it's own. They are aggressive toward dogs of the same gender and are not recommended for homes with cats or other small pets. As a working breed they were never intended to be household pets; boredom leads to destructive behavior. Polish Owczarek Nizinny are loyal and protective of their family, home, and territory and suspicious and aloof of strangers. They do well with children they have been raised with. This breed is not recommended for fastidious homes. Polish Owczarek Nizinny's are extremely messy as their coat collects all manner of debris. Polish Owczarek Nizinn's require daily brushing to prevent the coat from matting and to remove loose and dead hair. Bathing should be done when necessary. This is a healthy breed with no known health issues. Polish Owczarek Nizinny's do best in cooler climates. The Polish Owczarek Nizinny is a double coat breed. The outer coat is thick, long, straight, shaggy, and dense. The hair covers the entire body including the head and eyes. The under coat is dense and soft. This breed is an average shedder. Early socialization and obedience is a must. Bred to think independently and solve problmes on their own, the Polish Awczarek Nizinny has a tendency to be manipulative and dominant. Training must be done with firmness, fairness, and consistency. Polish Owczarek Nizinn's are not recommended for apartment living or for sedentary owners. The Polish Awczarek Nizinny requires an inordinate amount of physical exercise and mental stimulation. They do best in a large securely fenced yard or a rural setting with a job to do. Polish Owczarek Nizinny's enjoy hiking, biking, running, and family interaction. This breed excels at tracking, herding, obedience, and agility.